Doing drag and drop file uploads has interesting uses. Uploading resumes, pictures, and so on are all scenarios where this is handy. So here's a look at things I think about when it comes to drag and drop file uploads. Since files need to go somewhere, we start by setting up a drop area for them to land in. This just requires a little HTML and CSS. 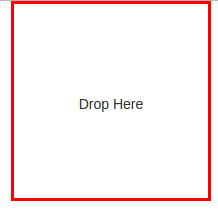 The aim here is a simple box with a border. Code like this should do the trick. And that's all on the look of it. As for DOING something with it, that's another story. When dragging and dropping into that red square, the browser needs to know how to react. By default, it has its own ideas. That div element will tell you to buzz off if we try dragging stuff over it with the mouse. So we'll throw in a preventDefault invocation to say to the browser "Relax, I got this." Then there are the drops which are their own kettle of fish. Often times, browsers seem to like popping open a new tab to display dropped content. We don't want that so another preventDefault heads that problem off at the pass. Now, as for the file, we have to dig into the event to this thing called a dataTransfer. To me, dataTransfer plays the role of a handbag to store things in when taking dragged stuff from point A to point B. I don't know if that's the official definition but, for our purposes, it works. For the moment, we just fish out the file that got stored there when we dragged it in. Then, we just display the name in the Chrome console. Hey look, a file! Time to escape the browser and hang out in Pycharm and iPython for awhile. The mad plan is to knock out server code that takes in just any old file that wants to come live there. The code does what it says. We grab the file out of the requests "files" dictionary. Then we put the file name through the Flask "secure_filename" to help prevent users messing with the system via sneaky file names. Save it to the folder and we're done. In : url = "http://localhost:5000/sendfile"
Okay, that was easy enough. Check the uploads folder .... it's there. Good. What's next? We can't avoid the client forever so let's get back on that. The thing to do next is to put together a request in a way that does a real upload. To do that, we have to take into account funny quirks as to how browsers like treating file uploads. One thing to take into account here. Browsers seem to like to turning files into strings that conform to some content type or another. We don't want to mess with content types here. The file should be uploaded just as it is. So what do we do? Fortunately, jQuery give you a couple of options such as processData and contentType to get around that issue. After making proper modifications, file dropping logic that looks like this. Now, just double check that uploads folder and say "Hooray, drag and drop uploading works!" We might as well list the files that are being uploaded. Triggering a fresh list of current files is easy enough. Just attach a request for a fresh list of files as a success response to the upload request. Might as well make the most of those promises, right? Adding something to the end of dropHandler would be a good start. Beyond which you need to implement that function so it actually takes care of getting that fresh list. Easy enough to implement. Standard handlebars templating. Click here and here if curious. Okay, so then what? That /filenames endpoint in the Flask code. We really should take care of that. But first, a quick tweak to send_file. A line like this after saving the file would be nice. # open and close to update the access time. The point of this is that I want to see the files in the order that they are uploaded. Doing a quick open/close changes the access time. Now we have files with a chronological upload history. Coolness! Oh yes, that /filenames thing. Here's that. Well, that was kind of weird and hacky. Notice this lambda? So here's an example of sorting based on the access time that you get from the Linux stat command. The "st_atime" stands for "stat access time". That refers to the time the file was last accessed. One other thing. We know that all those access times are in order of upload time because opening and closing files in /sendfile ensures that. But my God this code is awful! That code would have been a lot clearer if I avoided the lambda. Something like this is nicer now that I think of it. Yeah, that looks better. Avoid cancer in your Python code. Say no to lambda boys and girls. With all being said and done, you now have a setup for uploading files that lists the files you uploaded. It should look a little like this. FINAL CAVEAT: If you want to go public with something like this, read stuff on how to manage uploaded files in a secure way. Or let this be a starting point for a silly project that you have no intention of putting into prod. Oh, and here is a link to the Github project this article is based on. Have fun! I usually read them, take what I think is useful, what tool may suit me, and try to be creative about it in order to fit my needs. Many times things are oriented towards others things that I'm interested in.